Today, Brian will be filling in for Ketton due to last minute scheduling issues, we apologize for the post delay. Ferrofluids are quite complex fluids that display interesting behavior in the presence of magnetic fields. These ferromagnetic fluids are created through the colloidal suspension of ferromagnetic particles of the nano-scale. What does this all mean? In simpler terms, you essentially take tiny (nano-scale, or on the scale of a nanometer/a billionth of a meter; think the size of the base width of a single strand of DNA) magnetic particles and disperse them homogenously (or evenly) throughout a carrier fluid in a way so that the particles are fully wetted (meaning that the particles surfaces are fully coated by the liquid, without other particles in contact with them). Once the ferrofluid has been created, the next step is as simple as subjecting the fluid to a magnetic field, at which point the ferrofluid becomes magnetized. As the ferrofluid begins to be affected by the magnetic field, it wants to follow this field and comply with its geometry; basically, the fluid wants to become shaped like the field it is being subjected to, but there is a problem: the fluid has surface tension. Because the fluid has cohesive bonding between liquid molecules, the molecules are very strongly attracted to each other on the molecular scale. This should make sense to you, as when you run your hand through water (for example), you are able to readily cause bulk disturbances (you can split up the water on the large scale), but try as you might, you will not be able to split the water apart on a molecular scale (the smallest you can get water to by hand is tiny visible droplets, which are still collections of a ridiculously large amount of water molecules (on the order of sextillions, or thousands of thousands of thousands of thousands of thousands of thousands of thousands!). Because of the aforementioned strong attraction between the liquid molecules, fully immersed liquid molecules are pulled on by other molecules in all directions, as shown above in the picture. However, the molecules on the surface are only pulled on by molecules around and below (but not above) them, leading to a breach in the equilibrium and causing the water to be pulled in the direction of the rest of the water (hence the curved water surface exhibited in the above diagram). So, armed with this knowledge of how surface tension works, we can revisit the ferrofluids and figure out what is going on. The magnetic field wants to push the ferrofluid outwards, but the ferrofluid itself wants to pull itself back inwards towards the liquid base due to the surface tension, all while gravity is also resisting the spike formation (this kind of interaction is explained through the normal field instability). At some point all of these forces equate and the fluid is said to be in equilibrium. The result of this? Really cool looking spikes in the ferrofluid as shown above. This gets even cooler when sculptures are created (as in the top picture) by using shaped bases and manipulating the shape of the magnetic field. 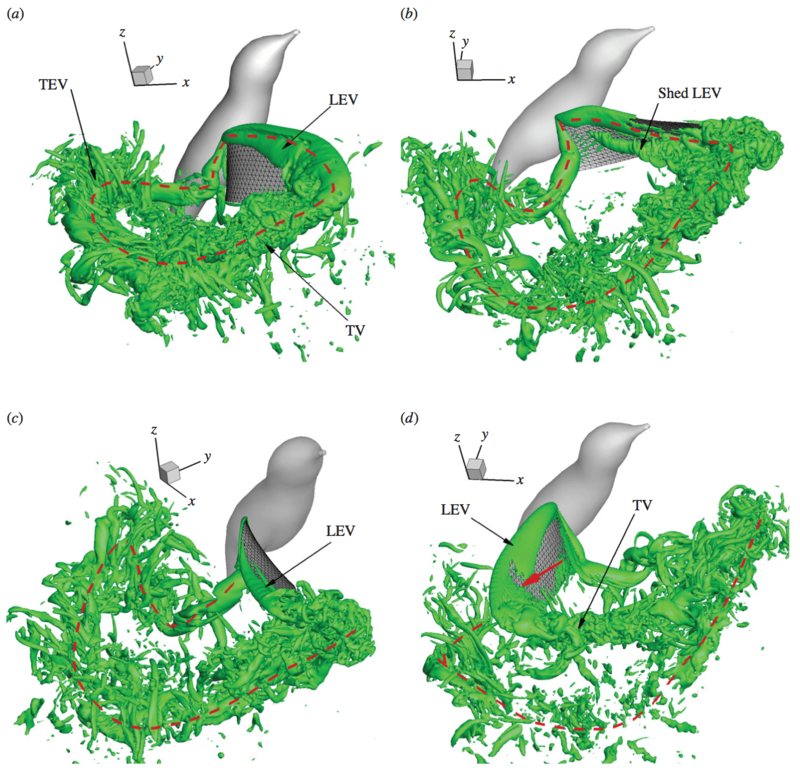 It should be noted that art is most definitely not the only application for these fluids; in fact, ferrofluids also find application as: liquid seals around the shafts of spinning hard disks/drives, as a convective heat transfer fluid for wicking away heat in small scale and low gravity application, as an imaging agent in some medical imaging techniques (especially magnetic resonance imaging, MRI), as friction reducing agents, as mass dampers to cancel out vibrations, and even as miniature thrusters for small (nanoscale) sattelites! So there you have it, another awesome engineering phenomenon! Please tune in Sunday for Ketton’s last Open Mind post and remember to continue following us at EngineeringAFuture.com when Engineering A Future (EAF) launches on Monday, July 13th! 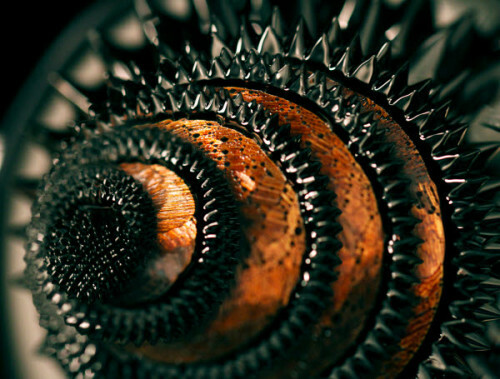 Enjoy the video below, created by altering the magnetic field in a ferrofluid sculpture! The Many Benefits of Ultrasonic Melt Treatment! Posted in: Presentations. Tagged: Engineering, Flow, Fluid Mechanics, Innovation, Manufacturing, Materials Science, Mechanical Engineering, Metallurgy, Presentation, Research, Science. Have you ever heard of Ultrasonic Melt Treatment? Me neither but I did some research and found some pretty interesting things. Ultrasonic Melt Treatment (UST) is essentially the addition of high frequency acoustic waves to a liquid melt of a metal (typically aluminum) to induce acoustic cavitation. Please note that acoustic cavitation is essential. The acoustic waves introduced into the melt have to be at a high enough amplitude and frequency to alternate pressure above the cavitation threshold to create cavities in the melt. Essentially what is happening is the rapid formation and collapse of bubbles in the melt which can have some beneficial effects before, after, and during solidification. The acoustic cavitation is said to activate the melt which means that it will accelerate diffusion, wetting, dissolution, and dispersion which will directly affect degassing, solidification, and refining of metallic alloys. Now if you’re into metallurgy this all sounds incredibly interesting, but if you’re not I will try to explain what each of these mean. Degassing is one of the primary uses of UST in which the concentration of a certain gas will be lowered in the melt. In light aluminum alloys, acoustic cavitation will cause the growth of fine bubbles in the melt on the surface of non-wettable oxides. As a result, cavitation will cause direct diffusion of hydrogen into the bubbles from the melt. Acoustic flow will assist in floating these bubbles to the surface and out of the melt. The benefits of degassing are that lower porosities can be achieved and thus higher densities in the final material. It has also been found that lowering the concentration of hydrogen in aluminum alloys will raise the ultimate tensile strength and ductility of the material. It is noteworthy that one study concluded that UST is the best amongst other commercial degassing techniques in terms of effectiveness in degassing and in time of treatment. Melts are usually cleaned of inclusions before final treatment. Aluminum melts usually use mesh filters but in order to filter out very fine particulates, multiple layers of successive filters need to be used. This is often not allowed because of the restriction of capillary action of the liquid melt through the filters, however with the use of UST during filtration, a sonocapillary effect is produced. This sonocapillary effect is caused by the cavitation field that is formed which allows for the melt to freely pass through the multiple layers and disperse unwanted oxides. 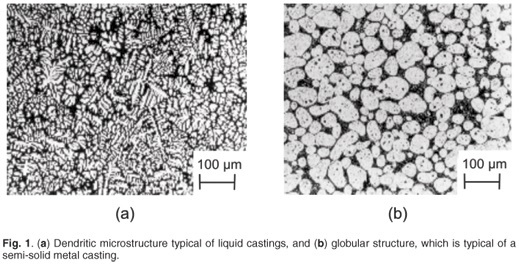 One of the most important benefits of UST is that it produces non-dendritic structures during solidification. A dendrite is a branched tree-like structure that grows during solidification of liquid metals (fun fact: dendritic solidification is actually what is behind the unique shape of snowflakes!). As mentioned earlier, acoustic cavitation allows for the wetting of non-metallic impurities in the melt and these become sites for nucleation (aka the start of solidification). Because these nucleation sites are ahead of the solidification front, there is no growth of dendritic structures. As non-dendritic solidification occurs, the grain becomes only a fraction of the matrix structure so there is refinement in grain size. It is important to note that grain size is only a function of cooling rate in these conditions, therefore this method of refinement is applicable to all metallic materials. One of the major benefits of materials with non-dendritic structures in Al-Si-Mg systems is that they are able to deform very easily at a semi-solid temperature ranges. Essentially what this does is allows the grains to rotate and slide relative to each other without the interference of the dendritic braches. This can dramatically improve mold filling by lowering the viscosity. The apparent viscosity of non-dendritic melts at the semi-solid temperature range is lower than that of the regular melts and is comparable to that of olive oil, at least for aluminum. Overall there are many benefits to Ultrasonic Melt Treatment in aluminum alloys such as degassing, refinement of grain size, and filtration. Although UST has only been extensively studied in non-ferrous alloys, recent research has been done on its effects in low-carbon steels and even epoxy based nanocomposites. In all cases it is the acoustic cavitation, duration of the treatment, and force of frequency that dictate the effectiveness of UST. Hopefully this taught you a little bit about UST. For more info, please refer to the paper by Eskin, G.I. “Broad prospects for commercial application of the ultrasonic (cavitation) melt treatment of light alloys”. Posted in: Presentations. Tagged: DIY, Electrical Engineering, Electromechanical Engineering, Engineering, Fun, Home Experiment, Magnetism, Mechanical Engineering, Presentation, Science, STEM. Electric motors are used in many applications from robotics to children’s toys. Although many of these motors are DC motors, Homopolar motors are the simplest of motors and are easy to show students in a classroom setting. All it takes to build your first simple motor are three common materials you can probably find around the house: copper wire, a AA battery, and neodymium magnets. 1) Attach the magnet to the negative side of the battery. 2) Strip the copper wire completely or for safety, in the middle and at the two ends. 3) Bend the wire so that one end touches the positive terminal and the other end touches the magnet. A common approach is a heart shaped wire for better stability. 4) Watch: As the copper wire touches the magnet, the wire will begin to spin. How does it work? Well the theory can get as detailed as you want it to be but to keeps things simple, I will explain the homopolar motor briefly. The copper wire connects the positive terminal to the magnet at the negative terminal. This completes the circuit, allowing current to flow through the circuit (and the wire). 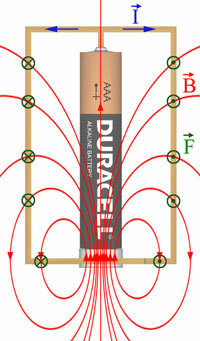 Due to the magnet, the current is flowing in the presence of a magnetic field around the battery. When current flows in a magnetic field, it will experience a force called the Lorentz force. This force acts perpendicular to the magnetic field and the flow of the current (and the wire). Consequently, the perpendicular force pushes the wire around the battery. Once you get a working motor, you can change the shape of the wire to any shape you want! Have fun! Tracking tags are used to gather data that concerning the behavior of whatever they are attached to. Often times you will see these tags attached to underwater creatures in order to gather large amounts of important information regarding the migratory patterns, mating behavior, predator-prey relationships, hunting/feeding grounds, social behavior, and feeding behavior of sea (as well as other) creatures, just to name a few parameters. As you can probably imagine, from an electro-mechanical standpoint, these devices must be very well designed and quite technologically advanced in order to be able to gather all of this information through logging positions, orientations, accelerations, temperatures, video, perhaps audio, and so on and so on. On top of this, the power supply must be capable of lasting a very long time so as to enable the data to be collected continuously without a battery change; either that or the device must be able to recharge itself (i.e. solar recharging), which would of course mean gambling on how much time the creature spends near or on the ocean’s surface where the sun can recharge the device. The device must also be attachable in a way that will keep the device in place for a long time without irritating the creature. Vibrations must be controlled so as to not irritate the creature or skew the data and interfere with the sensors, thermal management must be sufficient to not only protect the on-board electronics, but also to not provide discomfort to the animal, the device must be able to withstand impacts and the wear & tear of daily routines, and the device must not interfere with the creature’s behavior in any way. Combine all this with the fact that the device must be waterproofed, often to great depths, without interfering with the sending and receiving of signals, and you begin to see the formation of a pretty hefty problem statement. And oh yeah, we can’t forget that at some point the researcher must be able to get the data (and hopefully the device) back! And lastly, according to your boss, the design must be complete and ready for prototyping by noon Friday and you have a $30 budget! Theses kind of issues represent the same types of issues that mechanical (and other) engineers must deal with on every project they work on; as a matter of fact, the issues above share a great deal of similarity to many of the issues we had to design for in our underwater vehicle! (except that we had much, much more to design for since we were designing an entire vehicle, so we could rather equate the amount of issues above to those we had to design for for each of our 7+ subsystems!) This provides the background for an excellent conclusion and underlying theme in the world of engineering in general (and mechanical engineering in particular): You cannot design for everything. Uh oh, does this mean that mechanical engineers are not putting enough work into their designs? That they are being negligent? No, of course not, this is just a simple fact. As much as we might want to think it, the reality is that no design is perfect. As we have demonstrated time and time again here on TeamUV.org, mechanical engineering covers what is essentially an infinite amount of topics, and thus mechanical engineering projects require an infinite amount of considerations. It is humanly impossible to design for everything, because the engineer cannot think of everything. So what do we do instead? We pour ourselves into our work and give the project 150% of our all and do everything we can to consider as many things as we can, and then…we accept the fact that we could not have possibly considered everything, come up with a contingency plan for when (not if) an unforeseen issue arises, and we go back to work. So what does all of this have to do with tagging marine life? Am I just getting sidetracked? Nope, the reason I am choosing to talk about these things in this context is that this is exactly what has happened with these wildlife tracking tags. The engineers who created these tags did not spend enough time on one crucial detail that may have been seen as a relatively minor issue at the time, but which may have profound consequences regarding the validity of the data gathered and the well-being of the creatures themselves. What is this parameter that was not given enough attention? Drag. As many of you are aware, drag is essentially resistance to movement through a fluid. Underwater creatures are often streamlined very well because nature is the ultimate engineer and underwater creatures have been optimized for their lifestyle through generations of natural selection. When you attach a bulky electromechanical device to a creature that has been streamlined for the optimal results in its environment, it can have a disturbing effect on the behavior of said creature. Go figure. 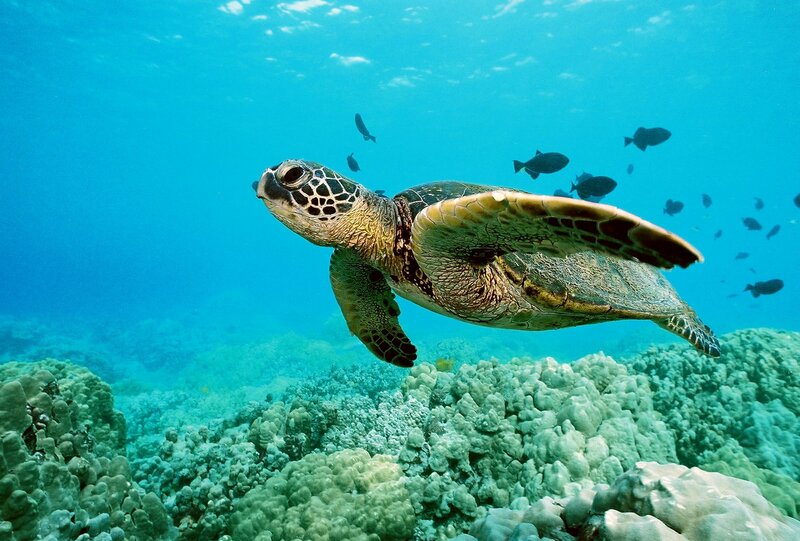 In fact, as researchers at the National Oceanic and Atmospheric Administration Pacific Islands Fisheries Science Center in Hawaii have found that the disturbance to the fluid flow over the creature caused by the presence of these devices is resulting in increased drag anywhere in the range from 5-100% depending on turtle size and age. This in turn translates to slower speeds for the turtles, lower accelerations, decreased maneuverability, and possibly even behavioral changes due to some unforeseen psychological or emotional effects on the turtles. As a final segue, this in turn can lead to turtles behaving radically differently with regards to patterns, travels, social behavior, etc. that could mean receiving skewed or otherwise invalidated data, as well as a possible decrease in the turtles’ psychological and even physical well-being. As seen in the video, in this fascinating study, these researchers are studying these disturbances are using some pretty innovative means to do it. 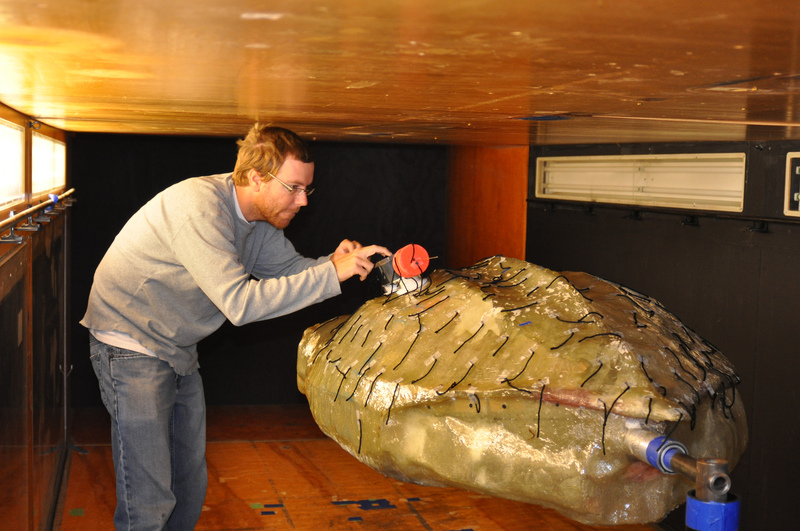 The researchers are using the bodies of turtles that deceased from natural causes to form molds to create fiberglass sea turtle bodies of various sizes, which can then be analyzed in low-speed wind tunnels to identify and quantify the flow disturbances caused by these devices. This is an excellent example of one of the major job roles for scientists and engineers: analyzing an issue that was perhaps not considered, not understood, or possibly even simply not known at all to be an issue beforehand in order to gain a better understanding of the issue and then remedy the issue by developing more polished solutions. One would only wonder why the tail fins were not taken into account in the model, as even though the disturbance is topside and the fins are located on the bottom of the body, with that large of a disturbance upstream, the flow about the tail fins would absolutely be effected in some way by flow separation and subsequent recirculation about the aft portion of the body. Oh well, moral of the story: it is impossible to account for everything, and sometimes it may even come down to cost-savings, ease of design, manufacture, or analysis, or even just simply deadlines. So what do we do? We put our best foot forward, give it our all, be prepared for the imminent issues down range, hope for the best, and to reiterate, we never give anything less than our all to a project for reasons of pride, protecting our reputation as engineers or scientists, and ultimately to do our best in the name of science and engineering. Please come back Sunday for my last Open Mine post on TeamUV.org! For more info on the above research, click here. Posted in: Presentations. Tagged: DIY, Engineering, Experiment, Fluid Mechanics, Fun, Materials Science, Mechanical Engineering, Presentation, Science, Thermodynamics, Water. We’ve all been taught that water freezes at 32F (0C) but in actuality water can remain liquid below this temperature, under special conditions. Imagine you’re sitting on your couch after a long day, you’re tired and you’re starting to feel a bit hungry, but the fridge is so far away. Eventually you get hungry enough to get up, go to the fridge, and satisfy your hunger. Water can relate. When the temperature of the water drops below 32F it would prefer to be a solid, but it takes energy to change from a liquid to a solid. As the temperature gets lower the water gets “hungrier”, it wants to be a solid even more, eventually it wants to be a solid enough to overcome the energy barrier, the “walk to the fridge”. When water wants to become a solid there are two ways it can go. It can either grow on a surface, like condensation on a cool drink or around a dust particle like rain, or, if it has enough energy, it can grow little spheres of solid within the liquid, without the help of a surface. The amount of energy required for this phase transformation is directly related to the amount of surface created. When the transformation is happening on, say the inside surface of a water bottle, the liquid only has to support the area of a dome, the bottle takes care of the rest. When there is no bottle to work with, or the liquid is far from the surface of the bottle, it has to have enough energy to support the surface area of a whole sphere. If you’re trying to replicate the video above it’s crucial to have very clean water. This means there are no little particles that the water can use to lower the amount of energy required to freeze, it has to save up enough to grow the spheres without any help. The water also needs to be cooled slowly and handled gently because any significant energy changes, thermal or kinetic, can give the water enough energy to start freezing. This is why hitting the bottle will start the reaction. When the bottle is hit, it finally gets the “oomph” it needs to get to the fridge (freeze). These phenomena (heterogeneous and homogenous nucleation) are also responsible for the famous Mentos and Coke experiment, why bubbles in carbonated drinks seem to come from specific points in the glass, and how engineers make aircraft aluminum strong enough to keep planes in the sky.